The Museum of World Treasures is very excited to announce that Tech Sergeant Cyril L. Leuelling, the man who first told the story behind the signed Nazi flag in the World War II exhibit space, will be visiting for a special Veterans Day event. There will be a reception open to the public and a special addition to the exhibit in his honor at 3 p.m. on Monday, November 11. If you have ever taken a tour of the second floor WWII exhibit, you probably remember the special flag that was signed by a group of soldiers and sent home from France. According to Sgt. Leuelling, some time in August or September of 1944 the members of his platoon were moving through the French countryside in pursuit of the enemy. At this particular time, they were engaged in various skirmishes and battles in and around the French towns of LeMans and Fountainebleau. One evening, the group spent the night in a captured convention hall, bedding down on the floor of the great room. The platoon leader, Sgt. Leuelling, noticed a Nazi flag hanging on the front of the stage. He removed the flag and had members of his platoon, including himself, sign the flag. The next morning Sgt. Leuelling went to the Army Field Post Office wrapped the flag, addressed it to his parents in Springfield, Illinois, and sent it on its way. Unfortunately he found that when he returned home after the war the flag had never arrived. He searched for the signed flag for decades. 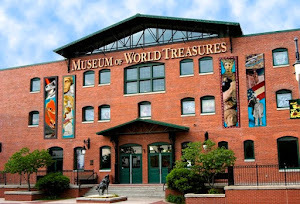 In late 2005 a portion of the flag was donated to the Museum of World Treasures. Museum staff and volunteers immediately began to research and attempt to find the men connected with the item. On September 27, 2006, a member of the Museum of World Treasures staff called a Mr. Cyril L. Leuelling of Morton, Illinois, believing he might be one of the gentlemen who signed the flag. Cyril was indeed one of the men to sign the artifact, and also the individual to ship it home. After over 60 years, Sgt. Leuelling was reconnected with the flag and the associated memories. At this time, the path of the flag from his hands to ours remains a mystery. Sgt. 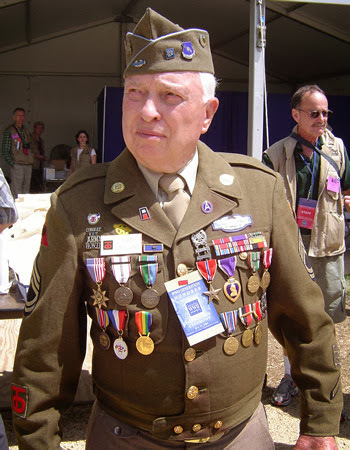 Leuelling is a highly decorated veteran of World War II. There will be a reception open to the public at 3 p.m. on Veterans Day, November 11, to meet Cyril and hear his story. There will also be a special addition uncovered to add to the flag exhibit space. Please join us in welcoming Sgt. Leuelling to the Museum. All military veterans and active members will receive free admission to the Museum on Monday, November 11 with a military ID. 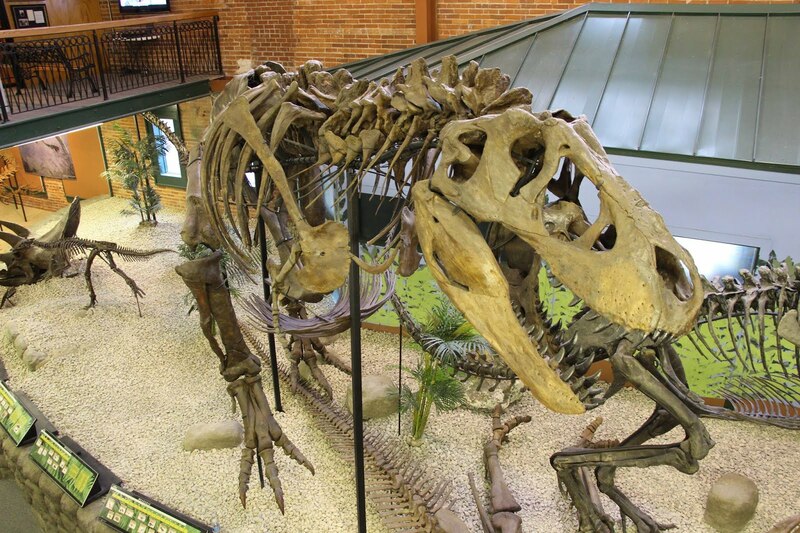 This reception is free to Museum members, or the cost of general admission for non-members. For more information please see our website or call the Museum at 316.263.1311. It is an honor to have met this 91 year old hero. 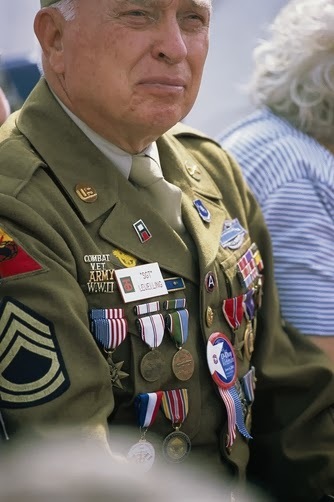 He fought in WWII from D-Day to VE Day. I always take extra time to talk to visit with him whenever he stops into our Walmart in Morton store. We think so too! Thanks for supporting our veterans and military.